Being a new student at The University of Cumbria I am keen to try and get involved with everything, when the Sabbatical Officers – Matt Tennant, Matthew Hayhurst and Amie Godward – told us in one of our first lectures about the volunteering opportunities available I jumped at the chance! We split into two groups; some went to experience Tree Surveying while me and the others, Molly, Hanna, Kati, Chris, Katrina and Sean, Councilor Paul Nedved, members of Friends of Rickerby Park, Cath and John went to transform the memorial bridge. We kitted up – welly boots for me as I did not wear the right kind of shoes, the yellow high viss vests, safety goggles (they did look cooler than they sound – trust me), gloves and wire brushed – and set off to work. Conversation flowed as people gelled – a thorough team effort – moral was high and soon we had one and a half sides of the railings flake free. I felt like I was camping as lunch time approached – the fires in the water boilers were stoked, the tea was brewing, smells of burning wood and leaves in the air as everyone sat around underneath the autumn trees eating hungrily, the dogs watching for any morsel dropped. A well-earned feast. .>The next task: painting! I think by far this was the most enjoyable task, to see such a difference from one side to the other. Our efforts did not go unnoticed as we were visited by the Mayor and Mayoress of Carlisle! Who showed/vocalised their gratitude, not just for our efforts today, but also the dedicated and continued work carried out by Green Spaces and The Friends of Rickerby Park. As we talked topic came round to another campaign Kati Brown is raising awareness for; The Sophie Lancaster Foundation, founded in 2009 after Sylvia Lancaster’s daughter, Sophie Lancaster, was murdered for belonging to a subculture (for more information please visit http://www.sophielancasterfoundation.com/) Kati is selling S.O.P.H.I.E. (Stamp Out Prejudice, Hatred and Intolerance Everywhere) wristbands for £1 and all proceeds go to the charity so they can teach people all over the world to accept all cultures – including and recognising subcultures. But I assure you this subject was brief and as the conversation ebbed and flowed we learned about each other, the park, and our task, we laughed and joked (no singing – maybe next time) and we made friends. 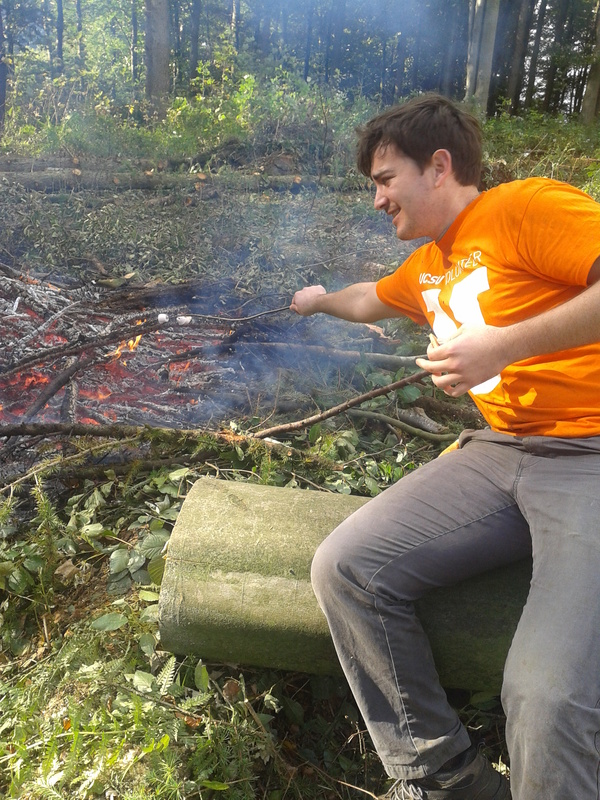 On Friday 11th October, a group of us went to the Sizergh National Trust property and gardens, to volunteer for the day, we were told we would be either gardening or working with the rangers creating fire, yes marshmallows were provided! As we separated off into groups I was unsure what to expect, being part of the gardening team. However I soon felt at ease, as we were introduced to Tom the key gardener and other national trust volunteers including; the very knowledgeable and charismatic Alan. We started the day by picking up apples that had fallen rotten to the ground, in which we were given the chance to taste some of the healthy ones on the trees! The next tasks included digging up begonias and replacing the soil so that new plants would grow successfully. After lunch we were given the fantastic opportunity to take a walk up the valley which not only gave us the chance to see fantastic views including Morecombe, but it also gave us the opportunity to interact with other members of the community whist they shared their local knowledge of the place, and gave us an insight to their lives. It is only then when you realise what a small world it is and you are shocked that people have visited your small village town which nobody has ever heard of. All in all I had slight reservations about participating in this day, not being a keen gardener myself, however the day exceeded expectations and I had a fantastic day. 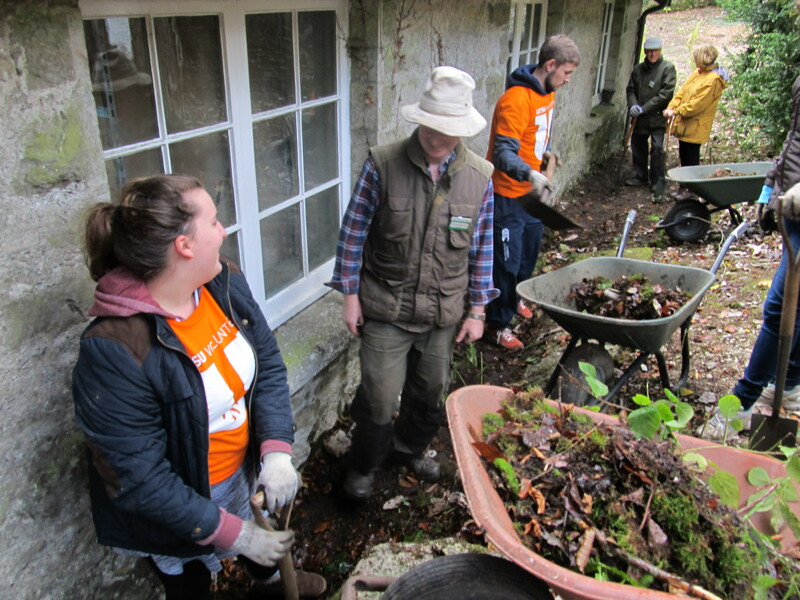 On October 11th 2013 myself and a number of other students volunteered for the National Trust Project Day at Sizergh Castle and Garden with the University of Cumbria. We were split into two groups to help out in two different areas of the garden. 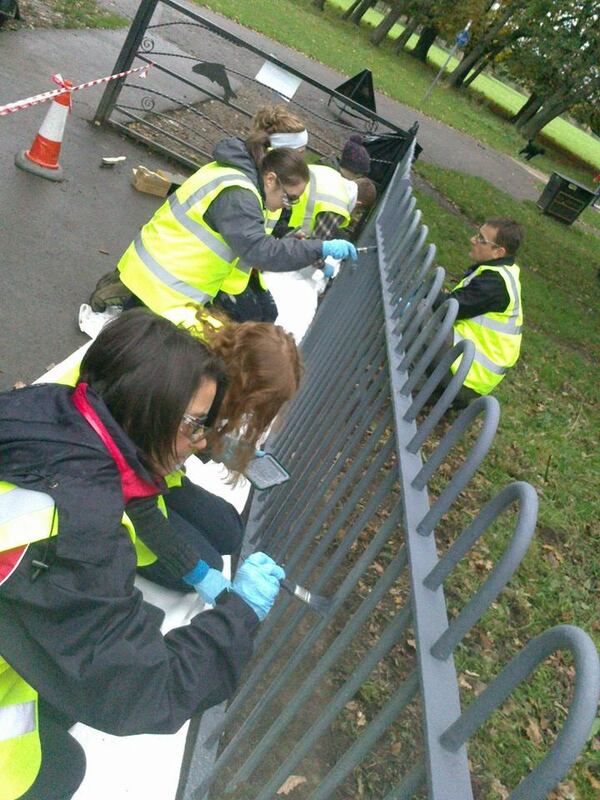 Myself and five other students were helping to tidy an area of the forest in order to maintain and conserve the area for wildlife. Cutting out bits of the woodland and re-planting is something the National Trust do every ten years as part of the management plan. To help maintain this area, we were burning beech and larch trees. This was to clear the area for the new trees to be planted, types of trees such as oak, holly, cherry and ash which are more beneficial for the wildlife. Cutting down these trees and planting new ones provides structure to the woodland area which can accommodate the wildlife better. The trees on the outside area are older and newly planted trees are in the central area of the forest. 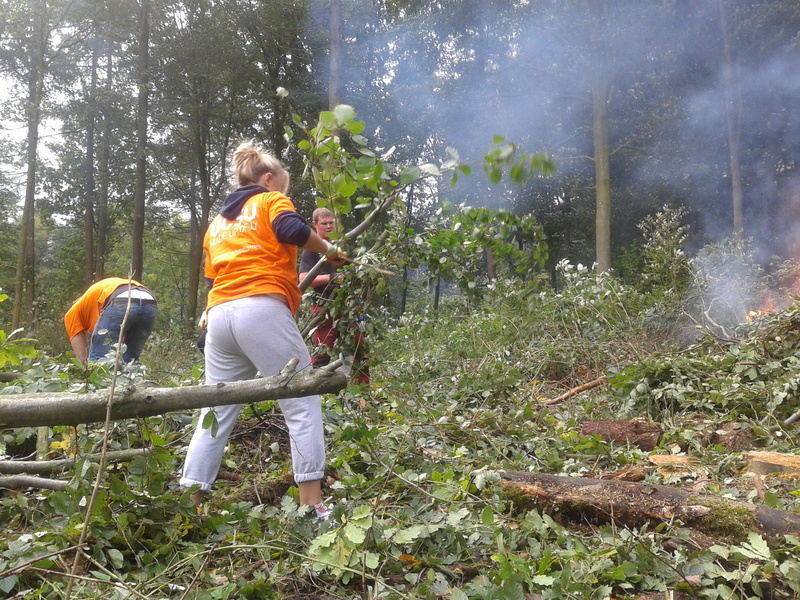 It was a physical, tiring task and with being close to two large fires we had to watch our step but the weather held off for us, providing the perfect day to spend volunteering outdoors. Seeing the end result of how much we’d cleared the area was the highlight of the day… as well as toasting marshmallows on the fire and making s’mores!